With our brand new Poetry Moves website up and running, poem cards are now available for online purchase as a fundraiser for the arts. Poets, friends and family of poets, and poetry fans everywhere can buy an authentic poem bus placard “retired” from service. These poems have already traveled an average of 20,000 miles onboard a C-TRAN bus — moving riders in more ways than one! 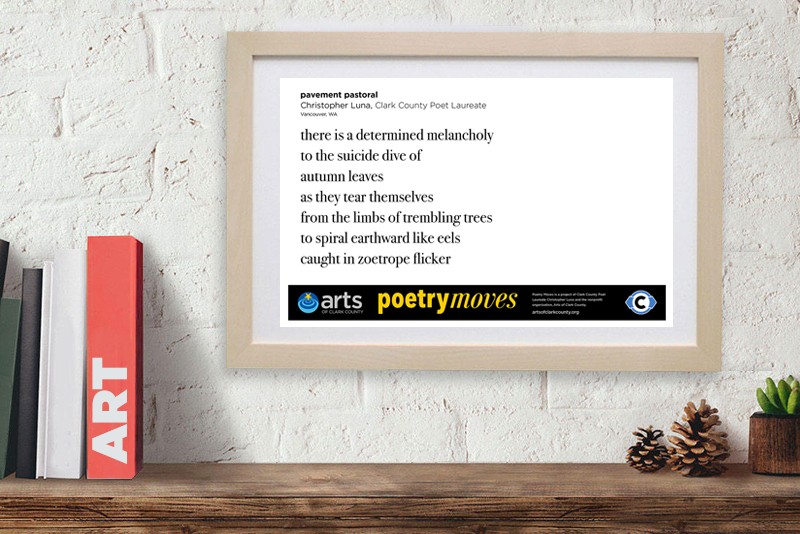 If you’re a supporter of the arts and of the Poetry Moves program, consider ordering a poem card printed on durable vinyl and suitable for framing. One poem card sells for $20, with all proceeds going to support the Poetry Moves program. Poetry Moves is a program of the nonprofit Artstra in collaboration with C-TRAN, providing poetry on bus channel cards in all C-TRAN buses.